The work culture in South Korea is different and managers here often say that they are used to the rigid hierarchy at work. SEOUL, Jan 21 2019 (IPS) - Despite the international rise of South Korean businesses like Samsung, Hyundai and LG as global powerhouses, the corporate culture in this East Asian nation is often known to have a vertically rigid command line. “When you have a good idea, you’d rather wait until you earn trust from your boss,” says Kim Chull-Soo, 42, who works at a Seoul-based finance business. “Trying to stand out in a crowd by explicitly speaking is not a good idea in Korean corporate culture,” Kim adds. But the Seoul-based Global Green Growth Institute (GGGI) has been initiating a corporate culture that is very different from this mainstream. From encouraging staff to be transformational without being afraid of sticking out, to having open plan offices which go against the traditional hierarchical structure of having individual offices, this international organisation is pushing boundaries as its fulfils its mandate to achieve resilient, sustainable growth. “We are building a united cultural front to strengthen our core values to be bold, excellent, inclusive and act with integrity,” Christel Adamou, head of human resources, tells IPS from GGGI’s head office. She adds that the organisational culture here is unique because it “is younger, more dynamic”. GGGI, an inter-governmental organisation committed to developing green economies through supporting its 30 member states, lists over 60 operational projects in all member countries. This includes projects that involve the development of: green cities, water and sanitation projects, sustainable landscapes, sustainable energy projects and cross-cutting strategies for financing mechanisms. GGGI has around 300 employees. And among international organisations, GGGI is one of the smallest so it has had to expand its capacity to meet its global mission. “We at GGGI need a much greater capacity to help member states in their transition to sustainable development and also adapt to climate changes,” Ban Ki-Moon, former Secretary-General of the United Nations the new president and chair of GGGI, said in 2018. The work culture in South Korea is different. And managers at most South Korean firms often say that they are used to the rigid hierarchy at work. Creating and implementing new ideas is usually made by the boss of the organisation, explains Park Jae-Min, 43, who works at a Seoul-based business group. “When we start something new, we are trying to listen and find out what our boss wants before we talk,” Park says. But if core values tend to be hierarchal in South Korean businesses, at GGGI head office the values of inclusivity, boldness and transformation are clearly visible. Adamou describes the organisation’s essence quite clearly from her first impression. “When I first came here in 2017, I felt the air of dynamism and enthusiasm in GGGI here I didn’t find before in bigger organisations.” She joined GGGI after her stint as chief human resources officer for the United Nations peace-keeping mission in Haiti and as legal advisor to the U.N. Dispute Tribunal in Nairobi. She also worked at other U.N. organisations and has been based in Switzerland, Liberia and at the U.N.’s New York headquarters. In South Korea, your job title also usually determines where you sit at work. But GGGI’s office space itself has an air of interaction and youth. In the open plan office, there is a lively and communicative air among the staff who are mostly in their 30s or 40s. At the office centre there is an open plaza where people relax over coffee, talk and brainstorm. “So there is a circle of staff, brainstorming, thinking together, designing the framework, how we would like to frame our values at GGGI. Decisions would usually be made top down, but for the culture-building initiatives, most was made in a bottom up way. [This way], there was more ownership, and of course the result was always better when you involve as many stake holders as possible,” Adamou explains. 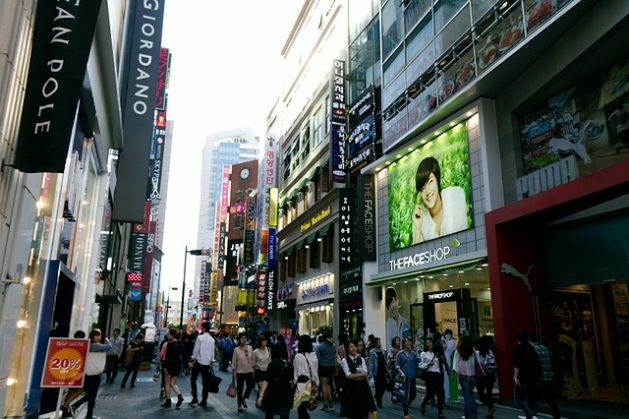 Meanwhile GGGI embraces the South Korean business culture of being competitive with integrity. Acting with integrity is essential for GGGI to communicate as a neutral, trusty partner, explains Adamou, “because the in-country projects are embedded into diverse entities like government, finance, environment and health”. Being based in-country also means that GGGI aids its staff in developing geographical mobility by increasing their exposure to internationally diverse settings. This, Adamou says, also fosters neutrality in the organisation’s work. “A head programmer in Seoul may become a country representative in Cambodia. Or an analyst in Ethiopia may be programming in Columbia. Otherwise, if you stay too long in one location, it may develop too much of a relationship with one government and it can hinder [their mission] to be neutral. We work for GGGI not for personal relationships [with a particular entity],” Adamou adds.